Cats often give a cute impression. They are adorable, graceful, lazy and playful. On the catwalks of this season, kidswear brands such as Anna Ovchinnikova, Anna Sui and Molo take inspiration from cats to highlight the naivety of children. The loveliness of cats echoes the fun personality of children. This report introduces cat patterns in different forms, all are warm and delightful. 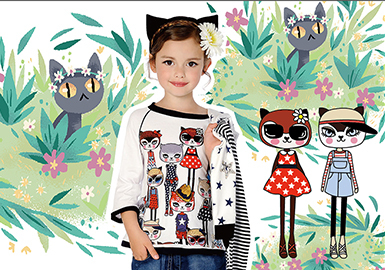 The cartoon cats reflect the cuteness of kids, while lifelike cats are statement-making.